Let’s cut to the chase: Scott was ostracized by the NAACP because he’s a black conservative Republican who refuses to subscribe to the myth that all blacks must be loyal to liberals and big government policies. It’s asinine for Jealous to suggest Scott, who is the product of a dirt poor single mother in South Carolina, isn’t concerned with civil rights. The fact of the matter is that the NAACP, who claims to be nonpartisan, vocalizes opposition against anyone who believes in conservative ideals such as school choice, limited government, lower taxes, and individual liberty. Rev. CL Bryant, a FreedomWorks fellow, held a key leadership role within the NAACP, including serving as president of the chapter in Garland, TX in the late 1980s. He noted that after he declined to speak on behalf of the NAACP at a pro-choice rally due to his religious convictions, the organization began to turn sour towards him and that it led to his inevitable departure. He was also relieved of his duties as a pastor due to his opposition to race-card cohorts Jesse Jackson and Al Sharpton, and after vocalizing his beliefs in the principles of limited government. Bryant and Deneen Borelli, Director of Outreach for FreedomWorks, reached out to the NAACP for support after many racial slurs were hurled at them for their outspoken conservative stance. The organization refused to respond or correspond with them in any way. And if you thought they were only hostile to individuals who differ in opinion, think again. Benjamin Jealous addressed the issue of voter ID in July 2012 at the NAACP’s Annual Convention in Houston. Unfortunately, he embraced the left’s absurd belief that equates voter ID to voter suppression and an assault on the rights of minorities. He likened the movement of opposition to voter ID laws to the Civil Right Movements in Selma and Birmingham. Mr. Jealous invoked this resemblance to elicit an emotional response during an intense presidential election cycle. What he neglected to inform the oldest civil rights organization in the nation of, is that voter ID prohibits voter fraud, which currently serves as the biggest hindrance to casting a ballot and ensuring fair elections. In July of 2010, the NAACP passed a resolution condemning presumed racism from the Tea Party. Hilary Shelton, director of the NAACP’s Washington bureau and senior vice president for advocacy and policy, made the assertion that Tea Party activists spat on Rep. John Lewis, a civil rights activist and friend to Dr. Martin Luther King, and called Rep Emanuel Cleaver the ‘N-word’. As of this date, neither claim has been proven true and no evidence has been presented to back up these claims. Many Tea Party activists have indicated on numerous occasions that racism will not be tolerated and that the movement is focused on making government fiscally responsible and ruled according to the Constitution. In 2006, NAACP Chairman Julian Bond compared the GOP to Nazis and compared judicial nominees of then President George W. Bush to the Taliban. The partisan rhetoric spewed by members of the NAACP proves that they are entrenched in the far left movement, and that they are not as concerned with civil rights and racial equality as much as they are about creating a false narrative that black Americans are victims and continue to live in oppression. By bringing these examples to light, I am not suggesting that conservatives ignore the NAACP. It is important to note that the NAACP was founded by the Republican Party and conservatives should challenge the NAACP to provide a message of equality and opportunity, instead of a message of victimization. The bias the NAACP hold is as bias as it is PATHETIC. They “preach” against racism, yet they deliberately picked Tim Scott out of all of the GOP Senates simply because of his skin color. It’s ridiculous. I really appreciate your blog posts, and how you’re real when it comes to politics, life, social issues, and most of all, a genuine walk with God. Keep on being who God made you to be. You’re an inspiriation to many out there. I’m really impressed along with your writing talents and also with the structure to your blog. I think that what you wrote was very reasonable. But, what about this? 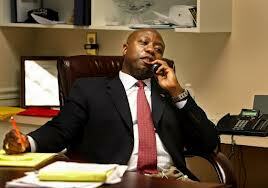 I mean Tim Scott Becomes Latest Beneficiary of NAACP’s Bias | demetriuspeaks is a little vanilla. I have been surfing on-line greater than 3 hours nowadays, but I never found any interesting article like yours. Hi, I do think this is a great site. I stumbledupon it 😉 I will come back yet again since I book marked it. him. Pretty sure he’ll have a good read. I comment whenever I appreciate a post on a site or I have something to contribute to the conversation. It is a result of the fire displayed in the article I read. create a leave a responsea response 😛 I actually do have some questions for you if it’s allright. Could it be only me or does it appear like some of these responses appear like they are coming from brain dead folks? Terrific article! That is the kind of info that are supposed to be shared around the internet. Hello, There’s no doubt that your web site could possibly be having web browser compatibility issues. Hello, Neat post. There’s a problem together with your web site in internet explorer, might check this? to be happy. I have learn this publish and if I may just I wish to recommend you some attention-grabbing issues or advice. blog for? you made running a blog glance easy. The entire look of your web site is excellent, as smartly as the content! I don’t even know how I stopped up here, but I thought this submit was once great.